Chicken pie kids cooking party. Chicken Pot pies can be made mini size for a chicken pie kids cooking party. You can make this as simple or complex as you choose. You can prepare your own homemade pie dough and give each child a ball of dough to work with. Or you can cut circles out of already made pie crusts to fit into small pie pans. It is a good idea to have extra dough and chicken mixture on hand in case you need it. For this kids cooking party, you will want to write down the chicken pot pie recipe below. Create one for each child that will be at the party. This will give them each a chance to follow the recipe while they are preparing the menu. It is also a good idea to include an extra one for them to take home, one that won't get messy. They can impress their own family with what they learned at the cooking party. Once you know the number of children coming go through the list of things needed especially utensils, bowls, etc. If you need extra ask friends or family if you can borrow some items for a chicken pie kids cooking party. Small individual size pie pans, if you don't have these available use a muffin pan and label each child's pie along the edges with masking tape. Prepare homemade pie dough. Or cut circles out of already made pie crusts to fit into small pie pans. You will need to make several batches of dough depending on the number of children. One batch of dough should make 3-4 mini pies with a bottom and top crust. It is a good idea to have extra on hand in case you need it. To start this Chicken Pie kids cooking party give each child two balls of pie dough and a mini pie pan. Sprinkle the table with flour and allow them to roll out a ball of pie dough into a small circle. Place dough into the small pie pans. If you are using already rolled out pie dough circles skip the above step and just add circle to pie pan. Roll out the second ball of dough into a circle for the top crust. As a team effort allow each child to do a certain step, add vegetables, chicken, and cream soup or homemade sauce to a mixing bowl. Have each child spoon mixture into their pie shell. With the second circle use mini cookie cutters or cut slits in the circle. Top pie with second pie crust. Cut off the excess dough around the edges and pinch the edges together. With a pastry brush, brush tops of pie with melted butter before cooking. Place on a cookie sheet and label with masking tape each kid chef's pie. Several children can share a cookie sheet. Bake at 375 degrees for 30 minutes or until crust is golden brown. During the chicken pie kids cooking party make time to prepare a dessert, decorate aprons, chef hats or play cooking games. 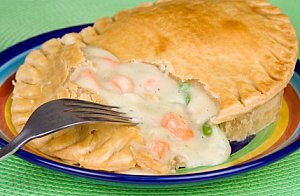 See more chicken pot pie recipes. Homemade chicken pot pie sauce to replace cream of chicken soup. In saucepan melt butter. Whisk in flour until thickens. Whisk in chicken broth and pepper. Bring to a boil until thickens. Whisk in milk and again bring to a boil until thickens set aside and allow to cool for the party. Back to Kids Cooking Party Page from Chicken Pie kids cooking party.